A 14-year-old Tullamore schoolboy, whose classmates mounted a campaign against his deportation, has been granted leave to remain in Ireland along with his mother and brother. Minister Flanagan has confirmed that the family has been granted leave to remain. He said he was "pleased that the matters have been resolved to the satisfaction of the family". Nonso was two-years-old when he arrived in Ireland from Nigeria, with his mother and his older brother, after his father died in 2006. The family applied for asylum, but their application was turned down and a deportation order was issued. Although their application was declined, the family continued to engage with the State through solicitors and sought to have a deportation order overturned. Nonso's supporters argued that the deportation would be unjust since he had spent almost his entire life in Ireland and was fully integrated into his community. Nonso's older brother Victor is a student of product design at UL where he was awarded a scholarship under the 1916 Bursary Fund. 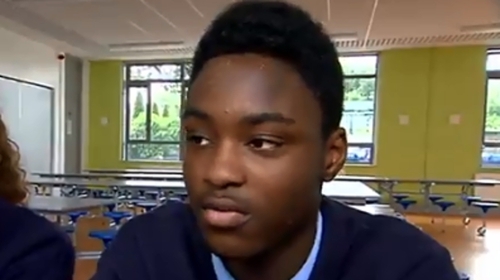 Like his older brother, Nonso is also a high achieving student at Tullamore College. The family had strong backing from local politicians. On social media Offaly Fianna Fáil TD Barry Cowen welcomed the move. He said he was delighted that Nonso and his family have been given permission to stay in Ireland. "I very much welcome the Department's decision to allow this family remain living in their local community of Tullamore," he said. Local Independent TD Carol Nolan praised Tullamore College staff and the local community for their efforts, while Fine Gael TD Marcella Corcoran-Kennedy said the support the family received from the local community was testament to the contribution they have made since moving to Tullamore over ten years ago. The petition to stop Nonso's deportation was signed by 22,000 people. Speaking through an intermediary the Muojeke family said it was "overwhelmed by the news" and appealed for privacy at this time.